We have our windows user profiles on a mapped network drive (M:\). That doesn't sometimes work very well with installations that is started using "Run as administrator". I usually map my personal folder (HKEY_CURRENT_USER\Software\Microsoft\Windows\CurrentVersion\Explorer\User Shell Folders\Personal) to a local temp folder during installation. 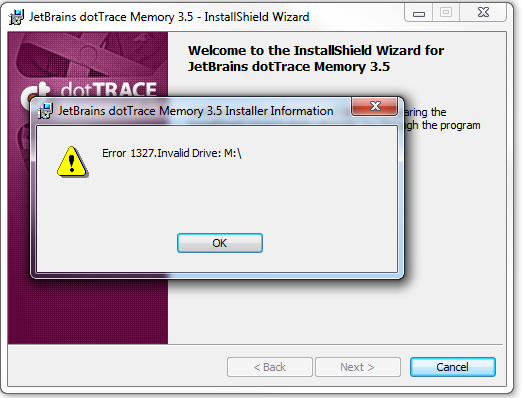 The problem with the dotTrace installation is however that you scan all drives for disk usage. That doesn't work very well since you can't access my mapped profile drive. Is it possible to skip that check in some way? Like specifying which drive to install on? 1. grant Administrator authentication to mapped drive: open command line as "SYSTEM" user and run a command "NET USE [drive name]"
2. don't create a profile on separate disk. You can mount a network path to a directory in the file system: for example, make a symlink to UNC path with "mklink" command. Please let me know if neither of these variants helps.